Lemon and yogurt have been used as a marinade in grilled chicken recipes for centuries. 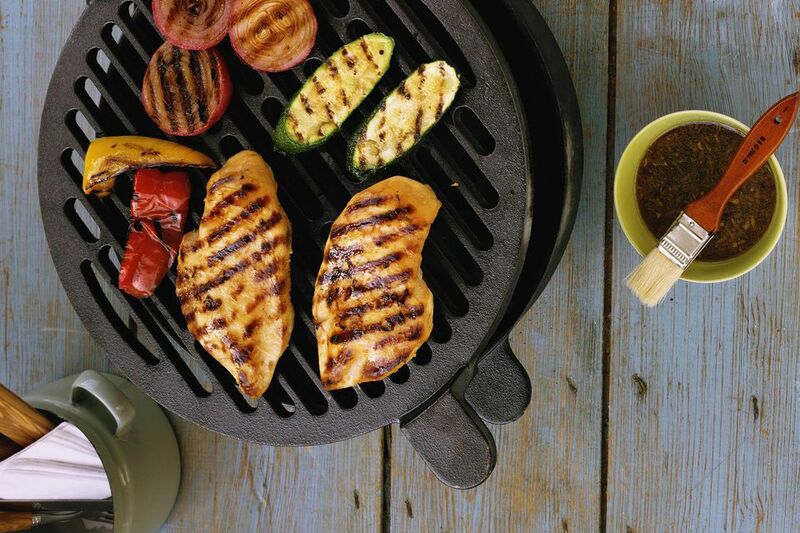 This grilled chicken recipe is simple to make, and the Greek yogurt marinade keeps the chicken tender and moist. The marinade also adds a subtly tangy and delicious flavor. Whisk together all the ingredients in a large bowl and add the chicken pieces. Toss well to completely coat the chicken with the yogurt marinade. Cover and refrigerate for at least 4 hours, up to overnight. Preheat a gas grill or if you're cooking with charcoal, light the fire about 30 minutes before time to cook. The coals are ready when they all are covered with white ash. Remove the chicken from the marinade and wipe off any excess. Season with additional salt and fresh ground black pepper to taste, if desired. Brush the hot grate lightly with oil and grill over medium-high or direct heat until the chicken is browned and crispy on the outside, about 15 to 20 minutes, turning as needed so that all sides are browned. When the chicken is perfectly browned, move the pieces a bit away from the direct heat to a cooler zone and put the lid on the grill. Continue cooking until the chicken is cooked through, about 45 minutes more, or until the internal temperature is 165 F.
Rice always is compatible with chicken. Classic rice pilaf, lemon-thyme rice, green rice or rice seasoned with herbes de Provence and garlic are all harmonious complements for lemon and yogurt chicken. Serve with fresh green beans and crusty French bread. Cold pasta salad makes a fine side dish if it's warm and especially if you're eating alfresco. A salad of couscous (similar to pasta), lemon, cucumber and feta cheese makes a tasty partner with lemon and yogurt chicken, as do Mediterranean pasta salad with feta, garlic, olives and artichokes; pesto pasta salad; avocado pasta salad with avocado bits and avocado dressing; lemon pasta salad with fresh asparagus, garlic, Parmesan and a spike of lemon; or a classic Caesar salad mixed with fusilli. What's to drink? Chardonnay is a prime choice for this menu, but sauvignon blanc and pinot grigio also are good choices. Iced tea or sparkling water with lemon would be refreshing on a hot day.